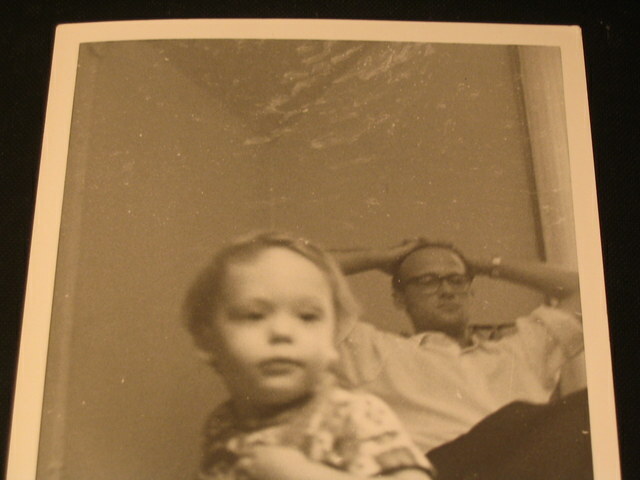 Tom Bauer, a Montreal writer, pens here a brief, poignant addition to the NC Childhood Series. Bauer’s writing is telegraphic and elliptical, yet he manages with few words to evoke the mind and memory of a child: the inexplicable nature of childhood, the mythic adults, the fear and confusion. The photo at the top seems iconic (the father looming, in focus); the one at the bottom moreso (the author inhabits only a corner of the picture looking dazed and uncertain). Lovely to add this to the collection. 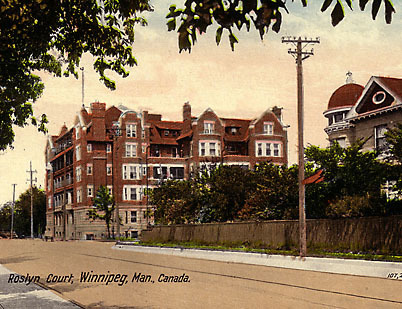 I was born in the Misericordia Hospital in Winnipeg, 1963. We always had animals in the apartment at Roslyn Court: a skunk waddling along the long wooden hall, cats bounding on tables. My father taught animal behavior, my mother worked in a zoo. My father liked to carry me around on his shoulders. I pulled his hair once so hard he cried. I was standing on the couch in his study. I’m not sure if he was genuinely hurt, or fake-crying, but I was afraid I’d hurt him. I felt sorry about it. I think I remember this because it jolted me with fear at the time. My father liked to stand at one end of the long hall in the Roslyn apartments and send me to the other. He’d open his arms and shout “Tovarich!” and I’d run down the hall into his arms. It was one of my favorite things. My father was German and his voice was sharp, his accent rough. In his study was a wooden Afghan stool made of yellow leather, a tripod stool. His chess set, which I still have, contains a roll-up chess mat made of vinyl. The pieces are large and wooden. His books smell of cigarette smoke. 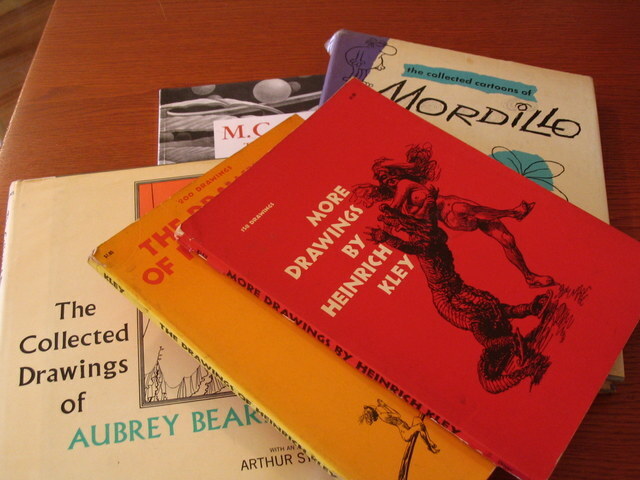 I looked through them all throughout childhood, memories for each: issues of Avant Garde, books of cartoons by Mordillo, the drawings of Heinrich Kley. He had a big record collection with Indian music and spoken word recordings of various poets, and liked to cook curry and burn incense. There were always pungent smells, cooking oil and cigarette smoke, the smell of empty beer bottles. I remember looking out the window waiting for my mother to get home. It is getting dark, sunset on the river, an evening view from five floors up. I am anxious for her to get home, the kind of feeling one gets in a dream. It might have been a dream, I don’t know. Sometimes dreams and memories get all mixed up. I remember riding in a car, must have been a friend of my parents as they didn’t own one, probably going to an Italian place, maybe on Lulu Street, where I snuck wine from my parent’s glasses when they weren’t looking. If I think about it now it must have been a game. They must have seen me take the glasses and sneak the sips. Apparently I ran along the street afterwards leaping at low-hanging branches, snatching leaves, crying out: “It’s spring! It’s spring!” I don’t remember that, it was one of the stories that get told, but I’ve heard it so often it feels like a memory. I can see the tree, the early evening air, my father calling my name, can hear the sound of my boy voice. 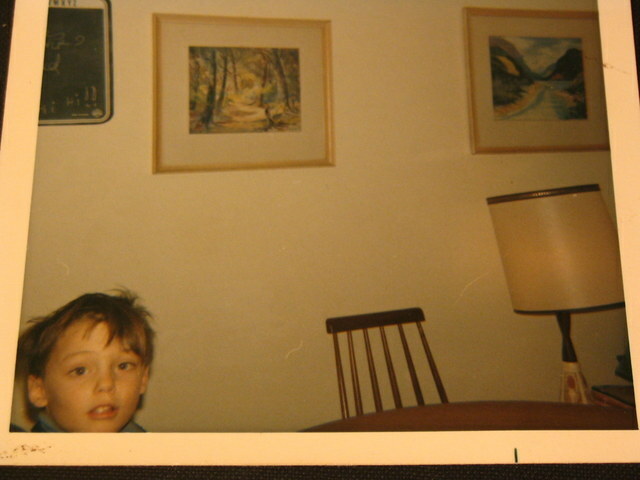 Later memories, after I was five and we moved to Montreal, into a house, are stronger, harsher. My father’s angry face, his belt, and shouting, warning me not to steal again, the forbidden smell of my mothers purse, her wallet, the sick feeling of taking coins and later getting caught and punished. Sometimes he used a bare hand, which hurt too much. I preferred the sting of the belt, less severe. There are many memories like this, vivid, clear, my mother overseeing from the doorway of my room, the bare wooden floor, the window near my bed, books and clothes on the floor, a half-finished plastic tank model, the smell of the glue and not getting the pieces to fit right, watching from the doorway as I’m told to never do it again, promising through tears, begging, the sick feeling in my stomach as I fear the pending spank, and crying. When we first moved to that house there was a vacant lot on the opposite block. It had been a Pom Bakery factory before we got there, torn down by then. Nothing left but yellow-earth, rubble, stones, some ruins at the far end of the empty lot. The kid next door, whose front door was painted white, was older. He had a basement full of stuff, including a BB gun, and a work area where he made things with tools and a vise. He was always inventing things. 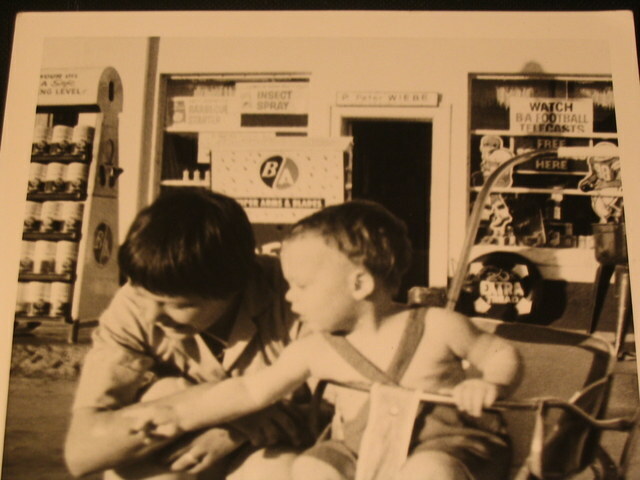 Many boys were like that back then, inventors of objects, tinkering with things in basements. Even I did a bit of that whenever we went to the suburbs to visit my mother’s parents, and my grandfather would let me into his basement with hammer and wood and I’d sit down there and bang nails in, smelling the soft odor of pine, the silvery smell of the nails and metal hammerhead. The kid next door took me across to the field, around in the rubbly parts, digging out odd-shaped bricks of some kind of orange bubbly plastic, deformed, almost molten, like cauliflour billowing out around the basic shape of a brick. He told me it was “Hash man! Hashish!” At that age I didn’t know what hash was, which probably took all the fun out of it for him. He asked me once to stand on the street and wait for a police car to go by, then shout: “Ew, it’s the fuzz!” I did, and he laughed. Tom Bauer works in television, researching shows for Discovery and History channel. 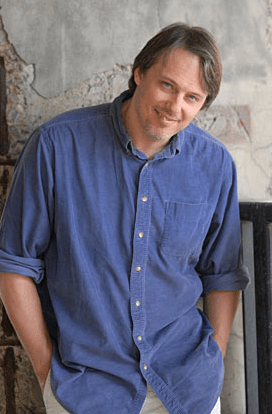 He has had fiction and poetry published in Maple Tree Literary Supplement, Headlight Anthology, and in the anthology In Other Words: New English Writing from Quebec. His stories have also been short-listed for the CBC Literary Competition and the Quebec Literary Competition. He lives and works in Montreal. Author photo by Karin Benedict. This piece really resonated with me. It was sort of heartbreaking despite your ability to be entirely unsentimental about your childhood. This is one of my favorite pieces on NC. This paragraph, “I remember looking out the window waiting for my mother to get home. It is getting dark, sunset on the river, an evening view from five floors up. I am anxious for her to get home, the kind of feeling one gets in a dream. It might have been a dream, I don’t know. Sometimes dreams and memories get all mixed up,” was something I seem to remember feeling at some point too. And so many memories could be dreams. You managed to root me firmly in your own experience while still reminding me of my own. What a touching piece. Thank you.